If you want to be part of the masterclass then apply here. Over the past few years I’ve had the privilege to see my writing published over 300 times in more than 20 publications like Fortune, Time, Entrepreneur, Forbes, Business Insider, Fast Company, Inc., Mashable, TechCrunch. I’ve written blog posts here about how to become a Forbes contributor as well as how to pitch your articles to the press if you’re not looking for a long-term writing gig but just want some PR love. 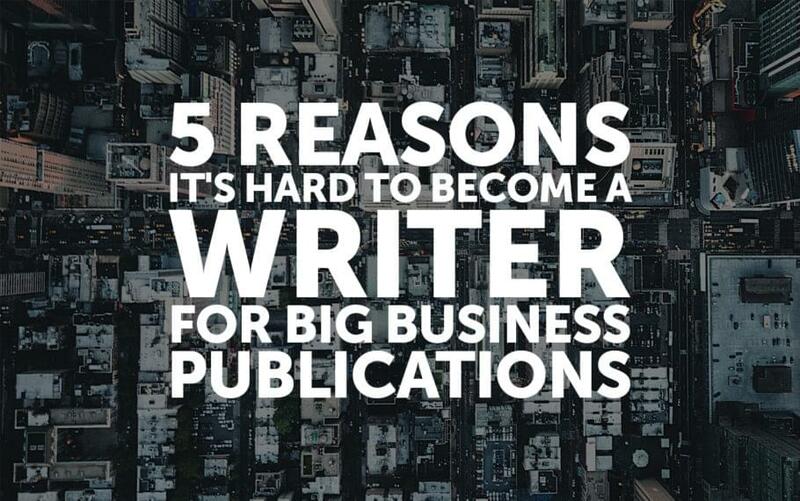 I even launched a masterclass to help people get into big business publications as a contributor. In that class I’ve seen some success, and some failure. In this post, I’m going to explain why people fail to get into contributor positions at the big business publications, and how you can use this knowledge to your advantage. Poor English. If American English isn’t your native language then you’re going to struggle as a contributor to a US-based publication. You must be able to speak English before you can write in English. If you’re not a native English speaker/writer you can mitigate this by attending immersion English classes in your area, online classes, and using free apps. Read LOTS of books and articles in English. Get native English speakers to review your work and provide feedback. Hire an editor, or a ghostwriter, or if you don’t have that kind of budget use a tool like Grammarly. Fun fact: I mentioned Grammarly in a Forbes article back around 2013 and they quoted me on their homepage and featured it there prominently for years. Poor grammar. This is purely a technical issue, and there’s no excuse for it. While good writing is overall an art form, this part is pure math. Grammarly is helpful here as well. Poor spelling. I know–typos happen. I find them every day on major news websites in articles written by professional journalists. But if you’re pitching an editor at a business pub and you have a typo in that pitch you’re really putting your worst foot forward. You must be ruthless about checking spelling and getting it right. Capitalization. Everyone knows Most people know to capitalize the first letter of the first word in a sentence, but is Jason the Managing Director of MWI in Hong Kong, or the managing director? According to Grammar Girl, “In general, titles that come before names are capitalized, and titles that come after names are lowercase.” Clear enough? But what about content marketing, should it be Content Marketing? No, it’s content marketing. You pretty much only capitalize proper nouns, by which I mean names of people or things, like President Donald Trump (I know that still sounds weird for other reasons than capitalization) or the Content Marketing Conference (which is really great, btw). Poor sentence structure. Do your sentences run on too long? Do you place words awkwardly? Is it hard for readers to tell which parts refer to what? For example, in the sentence, “Bill talked to John and he decided they would go through with the deal,” who does “he” refer to? We don’t know. Good sentences are easy to understand and don’t cause confusion, like this one “I would not ever want to say there are not people on our campus that at first in the classroom are not hard to understand, at least until students get used to them.” That’s a real sentence that was published in a newspaper–which I suppose goes to show that writing like this may not be a death sentence when it comes to getting into a contributor spot. Other common mistakes. “Excellent writing skills is required,” was actually printed in a job wanted posting. Where’s the problem? “Skills” is plural, so “is” should be “are.” I also hope you’re clear about your apostrophes, because their feelings can get hurt when they’re randomly placed here and there. Hope you are fine. I am Noel. I want to contribute on Forbes but i am confused that from where and which writer i choose and search for writing unique content with lines of Forbes. Can you guide or help me about it. Any reference for me please. I am very grateful to you for this act of kindness. Sorry Noel, umm…no. Maybe I should start offering a “catch-up” writing course for aspiring contributors…hmm. Jeff Bezos, Amazon’s founder, says “Your brand is what other people say about you when you’re not in the room.” What’s your personal brand? If your audience, coworkers, or friends had to complete this sentence “Oh, he’s the _________ guy,” what would they say to fill in the blank? If you’re not sure, they’re probably not sure, and that means you don’t have a strong personal brand. Step 1- Find Your Why. In his book Start With Why, Simon Sinek says “People don’t buy what you do; they buy why you do it. “That goes double for yourself. Without a ‘why’ you’ll feel aimless and will get confused about the simplest questions about building your personal brand. Once you know why you’re building a personal brand it will guide all the other steps on your journey. Step 2 – Identify Your Expert Zones. List out anything you’re good at–you don’t have to be the best in the world, you just need to be good enough that people might ask you for advice. Do people ever ask you for advice on managing their personal finances? Starting a business? Running a business? Optimizing their website? Building a following on social media? Write it down, the more the better. Make a big list. Step 3 – Choose Your Genius Zone. You may be good in your expert zones, but if you didn’t exist would the world miss you? Your genius zone is the one thing you can do better than anyone else–except it probably isn’t just one thing, it’s likely multiple things that overlap and where they overlap that makes you unique. For example, there are a lot of CMOs, there are a lot of people who have lived in China but are native English speakers, and there are a lot of writers, but how many CMOs are there with China experience who also are writers? Not many. Step 4 – Discover Your Audiences. You now know your genius zone, but who cares? No, this isn’t a flippant question, we really need to find out–Who cares? Once you find the people who care, you’re on your way to finding your audience. Make a list of all the different groups or types of people who might be interested in the information you have to offer. Don’t worry about which audience would value it the most, or which audience you’d like the best, just brainstorm a big list. Step 5 – Choose Your Ideal Audience. Now that you have a list of all your potential audiences, let’s narrow it down to the ideal audience to match up with your genius zone. Look at the list you created in Step 3 and answer these four questions; 1) Which of these audiences can I connect with the best? 2) Which audience has money? 3) Which audience wants what I have, and will pay for it? and 4) Which audience fills me with energy when I think about working with them? Write down the one audience that matches all four the best. If you’re still not sure, write down the top ones and come back to this later. Step 6 – Define Your Objective. You now know who you are. You now know who your audience is. Now–what do you want your audience to do? If it’s because you want money and you see this as an easy way to get it then I’m sorry–you’re not going to be a powerful influencer or thought leader. True thought leaders are motivated by something greater than money. Money is a measurement of value that lets a thought leader know people value her message. Money helps a thought leader to accomplish his goals (which should go beyond buying a yacht). Getting your audience to buy your book or your course is a means to an end, not the end in itself. Step 7 – Create Your Tagline. We started with why, now we’ve reached the how. The question at hand is how do we create a statement, a tagline, to position you in the minds of your audience such that they will trust you, listen to what you say and engage in the action you specified in the previous step? Creating your tagline is a major step. It might seem like something simple, but it will define everything else you do as you establish your personal brand. It will affect your website design, your content, your posts on social media, and how you talk about yourself. It is powerful because it is simple. Gary Vaynerchuk: I teach hustlers how to day trade attention. Suze Orman: I help families manage their finances. Simon Sinek: I help entrepreneurs find their why. Greg McKeown: I help people focus on what’s essential. Marie Forleo: I will help you become the person you most want to be. Tony Robbins: I awaken the giant within individuals. Ramit Sethi: I will teach you to be rich. The language doesn’t need to be exactly “I help” and “to,” you can modify it as needed. The point is to combine everything you’ve learned about who you are, your genius zone, your ideal audience, and your objective into a short, simple statement that quickly and clearly communicates the position you want to own. You may find it useful to go through this checklist more than once, since later steps can sometimes inform earlier ones. I also recommend that once you are fairly certain you’ve created your tagline that you share the filled-out worksheet with others you trust and get their feedback. They may provide insights about how others see you that will change how you see yourself and your place in the world as an influencer and thought leader. If you like this checklist, make sure you subscribe to my daily email newsletter, and I’ll send you the more detailed version of this checklist with bonus tips. If you follow these steps, you’ll end up with a strong personal brand that will put you way in front of everyone else pitching these editors. Me: Hi editor, would you take a look at Bill here and consider him for a contributor position? Editor: Sure thing, so how do you know Bill? Me: Oh, I don’t know him, he’s just some random guy who emailed me and wanted an introduction. Your email then gets deleted and the editor moves on to the next of 200 things he needs to get done today. If you have a close friend who is a contributor at the pub you want to get into then that’s great, by all means talk to your friend and let them help you–that’s how I got in. Make a friend of someone who can make an intro. The way to do this is not to email a contributor and say “Hey, can we become friends so you will introduce me to your editor?” That will make the contributor run the other direction. Instead, offer to help, without asking for anything in return other than experience. Note: This will only work if you can provide real help without oversight. It only works if you’re giving more value than you’re taking. The contributor doesn’t need someone to mentor, he needs someone who can do research, find facts, track down contact info for sources, and create rough drafts. Cold pitch via the email they provide for you. This is an almost sure-fire way to get rejected for no other reason than that it’s what everyone else is doing. Cold pitch an editor. Go read my post Who Do I Contact At Forbes To Become A Contributor? and then come back here and we’ll talk more about what makes a bad pitch. At this point we’ll assume you know how to write well, you’ve built a strong personal brand, and you’re pitching the right editor at the right publication. In other words, you should be a contributor at this publication, but you’re still messing up the pitch somehow. Here are a few things you may be doing to shoot yourself in the foot. You don’t know the rules. At Forbes they have various options for contributors, and they change regularly. One option might require five posts per month, while another may require half that. If you’re not aware of these details your pitch may show your ignorance, rather than showing you as informed. At Inc. they prefer that you write exclusively for them, so if you pitch them and say “I write for five other publications, I’d love to write for you also!” you may think you’re building a strong case, when in fact you’re taking yourself out of the game. Learn the current rules for how the game is played. How? Ask the editor you’re going to pitch. It’s as simple as “I’m preparing to pitch you to take me on as a contributor but I want to learn more about how it works to make sure we’re a good fit for each other.” Then ask 3-4 brief questions that are easy to answer in a minute or two. Asking a current contributor for advice is also a great way to get this information. Your pitch email is too long. Long emails get marked for follow up later, when the editor has free time. Editors don’t have any free time. Therefore your long email will never get read. Keep it brief and to the point. The editor should be able to read and respond to your email within two minutes or less. The response should be “Yes,” which means your only question should be a Yes/No question. Your email includes attachments. It’s a good way for your email to end up in spam filters. It’s about you. The editor doesn’t care how much becoming a contributor will help you. Everything about your pitch should be focused on what’s in it for the editor. When a jewelry store sells a diamond ring they don’t focus their marketing on how great it will be for their store if you buy the ring–it’s all about how great you’re going to feel wearing it. How great will the editor feel when you’re part of his collection? That’s what you want to hammer on. Many contributors make the mistake of thinking their job is to create great content. Book authors often make the same mistake of thinking their job is to write great books. The job of an author is to sell books, and the job of a contributor is to attract new readers to the publication. Want to impress an editor? Tell her you’ve got an email list with 50,000 subscribers who eat up everything you write, and if they bring you on you’ll bring your audience to the publication with you. You can also sell an editor on your social media following. And these audiences don’t have to be huge–an email list with 500 subscribers and an 80% open rate beats a list of 50,000 with a 0.01% open rate. If you have no audience and need to build from scratch, start with email. Sign up with Bryan Harris at Videofruit to get free tips on growing an email list. Get an account with ConvertKit and put signup forms on your website (I prefer ConvertKit to MailChimp, having used both extensively). I once introduced a friend to my editor at Mashable and a week later he was signed up as a contributor. That kind of story is rare. I have another friend I introduced to my editor at Entrepreneur. It took him a year of trying to get in. Another friend tried five times to get in at Entrepreneur before she secured a spot. Consider this story from the book Think and Grow Rich by Napoleon Hill. An uncle of R.U. Darby was caught by the gold fever in the gold-rush days, and went west to DIG AND GROW RICH. He had never heard that more gold has been mined from the brains of men than has ever been taken from the earth. He staked a claim and went to work with pick and shovel. The going was hard, but his lust for gold was definite. When it comes to becoming a contributor did you give it just one try, get rejected, and give up? Have you tried four times? What if the fifth time would be the time that works, like it did for my friend? Now that you know some of the biggest mistakes aspiring contributors to Forbes and other publications make, you can avoid these traps and save time, money, and stress. Sometimes having expert help can save even more time, money, and headache. If you’d like to join a community of other aspiring contributors-in-process, get access to coaching and editing from current contributors to big business publications, and have the kind of hand-holding in this process that will improve your chances 10x, apply to join my Power Publishing: Contributor masterclass. There are only 20 spots available and it’s first come, first served.